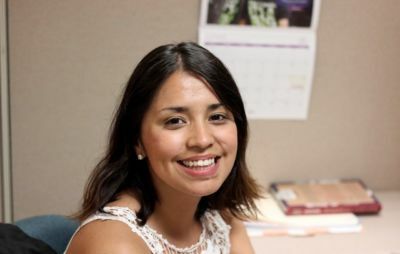 Continuing our celebration of Hispanic Heritage Month, this week we spoke with Itzel Delgado, a Match Advocate and member of our Spanish Speaking team. She opens up about her experiences growing up in a poverty-stricken area, being able to succeed thanks to her mentor, and now being a proud and successful single mom. She also shares what it’s like connecting BBBSMB and many of the Hispanic families we serve, some of the challenges they’re currently facing, and how we can serve them better as an agency. Enjoy! I grew up in what I would consider to be a typical Hispanic household, with a single mother trying to provide for her household of four children (including myself). As far as I can remember, we always lived in poverty, with my mom constantly working day and night just to make ends meet. The reality for my siblings and I was that we had to look out for each other, because my mom was constantly busy working and if she was at home she was often too exhausted to give us her undivided attention (which kids always seem to demand). I think this is the reality for so many Hispanic households. Parents are doing everything possible to make ends meet, which unfortunately often means that children are forced to fend for themselves. Thinking back now, I am extremely proud and inspired by how much my mother juggled; working full-time and being a full-time mother of four. I don’t know if I could’ve done that, but I do know that it was hard feeling like I had to be an adult and figure a lot of things out on my own. I was lucky enough to have had my older sister and we were far enough apart in age that she was able to help give me a lot of guidance and support. I remember her constantly pushing me to do well in school, so much so, that I was nervous anytime I brought home a B on my report card! My sister was really the role model/parental figure that I needed. Growing up in a single parent home and particularly in lower-socioeconomic settings, it’s so easy to get lost in the wrong crowd. I remember going to school with kids who often used drugs, began drinking at an early age, and many who were pregnant by their second year of high school. A lot of my friends from high school never made it to college because they got pulled into the wrong crowds. Without the guidance and motivation (at the time I might’ve called it intimidation!) that my sister gave me throughout my teen years, I could have easily became just another high school dropout statistic and I certainly would have never even attempted to apply to college. When your reality is a normalized setting of teen pregnancies and drug and alcohol use, it can be hard to find much hope in that. I think I was lucky to overcome all those obstacles and can proudly call myself only the second college graduate in my entire family! 2. How has your Mexican culture shaped you to become the woman that you are today? I think my Mexican culture has shaped me in a really incredible way! If there is anything that I can say about Mexican culture, it’s that hard work is valued so highly. Especially as immigrants in the United States, Mexican parents understand that they and their children are at a disadvantage and instill the importance of working hard and overcoming obstacles in order to achieve a better life. Just take a look at my mom; a single mother of four kids with no child support and no welfare, but still managed to get two of her daughters through college! I often think about her when I feel like my life as a single mother is overwhelming and I think about how hard she pushed herself to make sure my siblings and I could have a better life. Without the amazing example that my mom gave me, I wouldn’t be the woman I am today. I wouldn’t have the resilience that has allowed me to overcome the disadvantage of being the child of an immigrant. 3. Growing up in Latino Communities, what did you see or experience that could have been different if positive role models had a bigger presence? Growing up in Arizona, which is primarily Hispanic, I saw kids growing up in the same circumstances as me; single parent homes and living under the poverty line in under-resourced communities. I’m a living testament to what a positive role model could do for kids growing up in these circumstances. As I mentioned before, without the positive influence and push that I had from my older sister, I would have fallen into the wrong crowd, just like so many of my friends did. Without the positive role model that my sister was for me, I wouldn’t have graduated high school, nor would I have gone to college and I most certainly would not have received a full ride to college! I think what really pushed me was knowing that I had someone’s footsteps to follow in and I had someone to show me the process of applying to college and finding grants/scholarships. I also felt inspired knowing that I had someone that believed in me and who knew that I could make it. Without that positive role model, I would have never graduated with honors, despite having had a child halfway through college. Because of my own experiences, growing up in an under-resourced community and even becoming a young single mom, I can say that a positive role model can mean the difference between a child that overcomes their situation versus a child who succumbs to the circumstances plaguing many Latino communities. I feel so passionate about Big Brothers Big Sisters because I was essentially one of the kids that we serve. The only difference between my big sister and I and the matches that we serve is that we’re related by blood, but the outcomes that the child receives are the same that I received from having a positive role model in my life. 4. How do you interact with the families you serve on a daily basis? I get to interact with the families we serve in a really personal way, often getting to know their personal struggles, and how they affect their child’s match. I have the privilege of supporting the matches and helping guide them towards success, optimizing the impact our Littles get out of this program. 5. What does it mean to work for BBBSMB? Working for BBBSMB means coming to work and playing a special role in making a positive impact in a child’s life. It means creating hope and a strong support system for a child while at the same time being able to witness how Bigs fall in love with spending time with their Little. 6. How important do you think it is for you to be able to speak Spanish when communicating with families of the matches support? I don’t think I can put into words how important it is that I am able to speak Spanish and work with the Latino community! All of my Spanish Speaking families are always so grateful to have someone that speaks Spanish supporting them. They often invite me over for dinner and I’ve even had a parent come into the office with a home-cooked meal in hand to show her gratitude! Many Spanish speaking parents are overwhelmed with how little they are able to help their children due to their lack of English, but having a Spanish speaking Match Advocate helps them feel in control of the match; allowing them to feel like they are able to support their children while in our program. Furthermore, it allows me to communicate ways in which the program is positively impacting their children and ways that they can help make the program even more beneficial for their children. 7. What are some challenges that Latino families or children face? And how as an agency could we work on catering to this need? Many Latino families and children are facing poverty, limited resources, and often a very limited ability to speak English. Many of the families I support are the first in their family to have immigrated to the U.S and are still learning how to utilize resources for their children. Furthermore, many Latino parents are working long, laborious jobs, and aren’t able to be as involved in all the important facets of their children’s lives. As an agency, I feel that we are in a great position to cater to this need. By helping create deep and meaningful connections with a Big, Latino children are able to spend the one-on-one time that their parents are often too busy to provide. Additionally, the knowledge that Bigs bring to the table would be so helpful to Latino children. Especially regarding what it takes to get into college, how you apply, choosing the right school, and how to look for scholarships. These details are often overlooked, but the reality is that a lot of Latino parents will not be able to help their children with this. In the long run, I feel like this agency is a great resource for Latino families and children to begin integrating to the culture of the U.S and even learn about resources that will make them successful. 8. What advice would you give to someone interested in becoming a Big? I would tell them that the investment is so worth it and so many Bigs are surprised by the impact this program makes. Not only in the lives of children and their families, but theirs as well! We all have a desire to help others and what’s a better way to help, than being a mentor to a child that can learn and grow from this experience? 9. When do you feel like you’re making a difference while doing your job? I feel like I am making a difference at my job when I hear children talk about how much they love their Bigs. I recently had a Little tell me that he felt like “the luckiest boy alive” when he spends time with his Big. I also love hearing parents talk about the positive impact that Bigs make in their Little’s life, simply by being a stable, caring adult!